I'm excited to introduce you to our October guest designer, Tania Willis! Tania is a 36-year-old wife, of 18 years, to her husband, Doug and mama to two spirited girls, Ashlyn Rose and Emma Graces, ages 8 and 11. She is currently a Lead Fiskateer, leading a community of crafting ambassadors who are crazy about the Fiskars brand. In this role, she frequently blogs tips and tutorials on their blog at www.fiskateers.com. She also finds great joy in contributing design work to Fiskars for their online content as a Crafting Expert—allowing her to create projects and write articles that feature Fiskars tools. She has been an industry professional for the last 13 years, teaching classes, writing books, and designing for several manufacturers. Her passion is most definitely teaching her craft to others. She loves to make things beautifully handmade---making something from nothing. Her style is quite reflective of that, without looking crafty or homespun. She describes it as fresh and comfortable, polished and not forced, and technique driven with a strong focus on layering products. It often exhibits using products in unexpected ways, always with a touch of stitching…most often hand-stitched details. Her layouts follow basic design principles without looking graphic or linear. Tania has created some really fun projects for us this month using our SUPER popular Say Cheese collection! My family was lucky enough to take a trip to Disney World in July of 2012 and to be honest I’ve been rather stuck on how to deal with the massive amounts of photos we came home with. I’m talking a couple thousand photos, all of which I consider keepers, because, experiencing Disney for the first time ever makes every moment a Kodak moment, doesn’t it? But, really, how do you scrapbook all those photos? Well, Say Cheese is making my life so much easier when it comes to figuring out what to do with all these photos! If you find yourself in a similar situation, let me just tell you that grabbing a 12x12 Say Cheese Collection Kit is the way to go! I’ve created the following projects, have four more layouts in progress and *still* have GOBS of product leftover to create several more. This collection is seriously MAGIC! This layout was designed to be the opening page of our Disney album and was created using only materials found in the Say Cheese Collection Kit. I added mist, rhinestones and floss to help pull all the details together. While it might look like a fussy layout, it was one of the easiest layouts I’ve ever made thanks to the 6x12 Page Elements. By cutting the sheet apart into separate 6x12 sections, half of my layout was practically finished for me. All I had to do was adhere a photo and play up the embellishing a bit on the insta-camera. Here's that 6x12 Element Page that made this layout of Tania's so easy to put together! The background of this next layout happened on accident. I was in the studio playing with different colors of mists and trying to see which ones would react certain ways and decided to spray onto a full sheet of cardstock that was really just going to be trashed after I was done experimenting. Turns out that it makes a very fun layout for this photo! The mists I’ve found that match the collection best are the Heidi Swapp Color Shine in Black Velvet, Sweet Cherry, Mustard and Chartreuse. This next layout was one of those 15 minutes or less layouts! How can you create a layout in 15 minutes or less? With the 4x6 Vertical Journaling Card Elements, that’s how! I laid the photos and two journaling cards on the page and filled in the remaining spaces with patterned paper, punched a few border strips using the Fiskars Postage Stamp Border Punch to add down the sides to help draw the eye to the middle of the layout design and called it good! I kept the embellishing simple and used some of my favorite techniques to add dimension and interest to the layout. Here's the 4x6 Vertical Journlaing Card Elements that helped Tania put her layout together in 15 quick minutes! Lastly, I used one of the 4x6 Horiztonal Journaling Card Elements to pull together a quick card. I cut the card base to 7” x 10” so it would give me a 5” x 7” card to build my design on. A simple border was punched from mustard-colored cardstock using the Fiskars Up In The Clouds border punch to frill up the lower edge of the journaling card. Additional embellishments were added directly on top of the card. I’m a firm believer in embellishing the inside of cards, as well. They just look so much more pulled together when you take a few extra minutes to pull elements from the card front in to the inside of the card. I repeated the same background color as the journaling card, added the same border and same photo corners and used stickers from the Expression Cardstock Sticker sheet to mimic the sentiment on the card front. Easy peasy, yet looks beautifully handmade! Just my style. Thank you so much for allowing me to share the beginnings of my family’s Disney album with you! Thank YOU Tania for sharing your creativity with us this month and for showing how our readers can quickly and easily create with our products, such a treat!! Hello, Simple Stories fans! 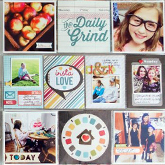 Melissa here today to share a 6x8 Sn@p album using the I Heart Summer line! The album documents a two week road trip that my husband I took this summer, and I'm so excited to be getting photos of this adventure scrapped! Before I get started, I have a confession to make- I meant to put this album together on the road, and it never happened. I took it with me and even made a little kit of supplies to work on it while in the car (we drove nearly 4,000 miles total! ), but we were already doing so much that a few days in I decided to put it all away and just enjoy the trip. It was a great decision, and now I'm getting to re-live those fun moments again as I scrapbook them. I'm using a mix of 6x8 divided and full-size Pocket Pages as I assemble the album. The divided pages hold photos and journaling, and I'm using the full 6x8 pages to keep the brochures from each National Park we visited along with documentation from our various camp sites. As I'm scrapping the album (I'm sharing the first third of it today), I first choose photos and the Pocket Page that best matches them, and then I go back and add journaling cards and writing. Once I've done that for several pages, I then go back with embellishments and add a few touches here and there to finish things off. Simple Stories products make this a very quick process! I always seem to include tons of photos in my Pocket Page layouts, which doesn't leave a lot of room for embellishment sometimes. In this album, I decided to add some fun little bits in the form of chipboard, stickers, and a title to each of the 6x8 memorabilia Pocket Pages, just for a little more color. I love how Simple Stories makes a daunting task like documenting a massive vacation easy and fun, and I'm excited to dive in and finish up the rest of this album. For supplies, I used the I Heart Summer collection along with a 6x8 Sn@p binder in brown and an assortment of 6x8 Pocket Pages (I used at least one of each design in the collection). I love this pie chart card. It's probably the math teacher in me, but I love thinking of the categories you could place in the chart. This is a 3x4 card that's designed to be used by itself, but I love the idea of using it with the other diagonal 3x4 card attached as well. SN@P! has made the process of documenting so much easier for me! How about you? So, I'm certainly NOT a math teacher(!) like you Kay, but I too love the pie chart! I truly love everything about this card from the pretty blue and red color combination, to the inspirational quote by Walt Disney. Add that to the cute cloud graphic in the background, and this card just makes me smile. AH! This is one of my favorite cards, too! In fact, it was going to be my pick for next month. Looks like I'll be picking another card, eh?! Boys are the story of my life - I live with three boys, a husband and even a male dog. So this one little card says it all for me! Not to mention that I am a sucker for chevrons and the orange and aqua and blue color combo! I know I at least need this card in triplicate!! Yes, I know....I have picked 2 cards, but you just can't have one of these without the other! I love this set because after 28 years of marriage, my husband and I can still say the same words but mean two different things! These will make the perfect page to document that strange phenomenon! Congrats on 28 years, Kim! I hear you on saying the same thing, and meaning 2 different things - MEN! I love this card because it describes me perfectly- high energy! I'm always moving, going, and doing as long as I'm awake, and I don't stop until I literally fall into bed. I'd love to bottle some of your energy, Melissa! If you've been following along with Pick a Card, Any Card feature here on the blog, you know about the Pick a Card, Any Card class I'll be teaching at True Scrap 5! The very best thing about this event - everything is recorded. EVERYTHING! Meaning if you can't attend live (virtually), everything is recorded so you can go back and view it later at your leisure. Even the middle of the night for you insomniacs out there! Happy Friday! It's Jill Cornell here with a couple of Christmas cards to share using the new December Documented collection and templates from Kiwi Lane. On the first card, I used the wavy borders from the Sunnybrook Lane border templates to make a winter scene. I love that cheerful snowman sticker that I tucked into the waves (snow drifts). I tied the chipboard candy canes together with a piece of baker's twine and tucked them in as well. On my second card, I used the Tiny Brackets from Kiwi Lane as a template for the green polka dot patterned paper below the sticker sentiment. I machine stitched the card and bracket piece for extra texture. Tiny brads were added to the present sticker. The templates were a quick and easy way to add shapes to my cards without the hassle of using a die-cut machine. Hi all! Kay here with a Life, Documented week to share, as well as a layout. I was fortunate enough to work with the Kiwi Lane templates, and used them on both. I used Smarty Pants for both my week and my layout as well, as it was back to school for both me and my daughter. Here is the full week. On the left side I used a Kiwi Lane template to create an arrow where I placed letter stickers. And on the right side, I wanted some journaling so I used this template which I cut out of grid paper to house my thoughts. Here is a close-up of the arrow . . .
And my journaling spot . . .
As always, I used my Faux Leather Brown Album. And for my layout I used one of the border templates to frame the picture portion of my layout. Today, I created a fall themed page with Simple Stories lines that are not specifically fall related. I also got to play with some Kiwi Lane products, making this a double whammy post today! Here's a little peek at my process. First, I like to start with my main elements. I chose fall colored paper from Smarty Pants and Say Cheese, die cut some pumpkins, and chose two Kiwi Lane templates. Next, I like to push the pieces around a little bit to figure out placement. This gives me a good idea about what size my photos should be. You can see at this point that I've used the Kiwi Lane templates by tracing them onto the paper and then cutting them out. So simple! And here is my finished page! I ended up changing the placement of the page and I trimmed down the borders. I layered two here by using the negative side of the paper after the first was cut. I also replaced my initial bracket shape with one a little smaller. By using the basic prints from these two Simple Stories lines, I was able to create a theme that wasn't there before! I love how it came out and I got even more out of my scrapbook products. I hope this inspires you to look a little harder to make your paper and accessories your own twist! And a big thank you to Kiwi Lane for letting me try their templates! This month Simple Stories has teamed up with Kiwi Lane Designs and we got some super fun templates to work with. I received three different sets (Tiny Brackets Accessory, Journey Accesory, and Sunnybrook Lane). These are super fun templates and I wanted to incorporate one template from each of these collections on to my layout. I used the Smarty Pants collection to create my page. There's so many great colors and designs in this collection. I love it! The middle section of my layout I used the long & curvy templates from Sunnybrook Lane and traced them onto some navy patterned paper. I then outline the edges in a white gel pen. The title 'spot' I used a template from the Journey accesory collection, tracing it onto some green patterned paper and then adhering some letter stickers to create my title & some chipboard stars & a brad/pencil embellishment. I adhere that to my layout using some foam squares. I added some stickers & chipboard embellishments in various places throughout my layout. On the lower right corner and upper left corner of my layout I used a bracket shaped template from the Tiny Brackets accesory kit. I first traced the template onto the red patterned paper. (TIP: When tracing templates like these it's often a good idea to flip the template over and then trace the image on the backside of the paper you are planning to use. That way the pencil/pen lines will not show.) Here I wanted the red speckled-like paper to be on the top so I traced the template on the 'lined' side. Here's a closer look at where I used one of those red cut out bracket shapes. On these pieces I outlined them in black pen. These templates are super easy & so fun to use! Thanks Kiwi Lane Designs! Hi everyone, Marie here today to share a Life Documented project made with the Say Cheese collection, with a little help from some Kiwi Lane products. When I first saw the Say Cheese collection I loved everything about it. However I didn't really have any Disney pictures on hand. Not to worry though, the collection is so versatile I soon realized it would be perfect for a different project I wanted to scrap... dogsledding in Alaska. The colors worked really well with the photographs. Blue coordiated with the blue skies, red accented the helicopter and dog leashes, and yellow was a nice accent color. Captions like "adventure" and "dreams do come true" went perfectly with this project. I even found a perfect spot for the "just being goofy" card, next to two puppies playing together. I used a Sn@p! Page and Sn@p! Pocket to create an insert between my pages. The Sn@p! Pocket holds the ticket and some tags from the trip. Here's a look at the back of the insert, with a picture taken while actually riding on the dogsled. The second page presented a bit of a challenge. Across the top there was 4x12" Pocket Page opening, but my printer only prints up to 8.5" x 11". So when I printed the top photo of my husband in landscape mode, I had a one inch gap on the page. This is where Kiwi Lane came to the rescue. I used their Tiny Bracket templates over some journaling I did on the computer, and then I knew I'd have a perfect fit to layer over the gap on my page. These brackets are also perfect for adding paper accents to photos. I was really happy using the Say Cheese collection in a different way. I hope this gives you some inspiration to use the new lines with all sorts of projects! I am using the 12x12 Sn@p! Faux Leather Album in Teal. I love the quality of these albums along with the stitching detail around the edges. I couldn't help but use the Sn@p Cuts card as the title - it just reinforces what I want her to get out of her school experience. And to finish off the layout nicely, a sprinking of words, stars and other stickers from the collection, all reinforcing that school theme! And finally, a quick idea to share . . . beside this layout in my daughter's album I will have a 12x12 pocket page where I will keep her class award along with a few other bits and pieces from her Prep year such as writing samples, drawings etc. I quickly embellished a 4x6 Sn@p Card to add to the front of the pocket as a label. I think I will try to do this every year as a place to keep all those things that I can't bear to part with! Today I'm back with another Fan Focus Friday! We have so many great Simple Stories fans out there that we thought it would be fun to showcase some of the work shared with us. I'm a New England transplant from Massachusetts now living in upstate New York with my husband, Tom and middle school-aged daughter, Alexa. I've been paper crafting since 2001 when I was presented with an empty 12x12 album as a baby gift. After staring at it for six months, I decided it was time to figure out what all of the hoopla about scrapbooking was about. It took only one class at a local scrapbooking store and I was hooked! I love mixing and matching bits and pieces to create embellishment clusters on my pages and it's a rare page that doesn't feature some kind of stitching, whether it be by hand or machine. Layering is part of my "signature" style. While scrapbooking is my first love, I also enjoy making cards and the occasional altered project. When I'm not scrapbooking or chauffeuring my daughter around, I can be found puttering in my garden, reading a book, cooking up a new recipe (and sharing the good ones in the Tasty Tuesday posts on my blog), or taking photos that will later be committed to paper for all time. Such a fun layout! I'm amazed at how much Lisa managed to include on this layout without it looking too busy! Lisa has such a knack for layering products, wouldn't you agree?! I love the close up photos of the smore ingredients on this layout! Today I'm back for the 2nd month of our new monthly blog feature called Fan Focus Friday!